When Rex's parents tell her they are adopting a new baby, Rex is afraid she will turn into the Invisible Girl in her own house. Determined to be a good big sister, Rex starts spending all her time with the baby. Now Pinky is afraid that he has lost her friendship. 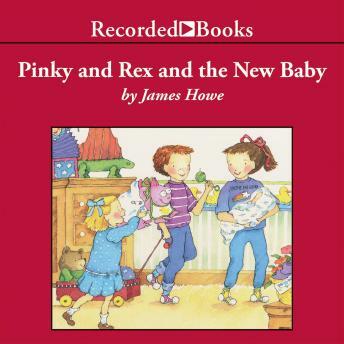 Can Pinky and Rex's friendship survive a cute, warm, and cuddly new baby? Or will Pinky become the Invisible Friend, and have to find someone else to play with? In this sixth book about an inseparable pair of best friends, acclaimed narrator Christina Moore again teams with author James Howe to bring to life a story of true friendship. Other exciting titles in this series include Pinky and Rex, Pinky and Rex Go to Camp, Pinky and Rex Get Married, Pinky and Rex and the Mean Old Witch, and Pinky and Rex and the Spelling Bee.